A FULL LINE OF ITALIAN GREYHOUND CLOTHES! ITALIAN GREYHOUNDS are thin, with deep chests, long legs, and very high tucks. Italian Greyhound clothes need a unique shape to fit well, be warm and look good. Houndz in the Hood makes BODYSUITS, JAMMIES, ROMPERS, SWEATERS, LIGHT SHIRTS, SWEATSHIRTS ALL CUT TO FIT ITALIAN GREYHOUNDS! CHINESE CRESTED, XOLOS, JACK RUSSELL TERRIERS, MANCHESTER TERRIERS, MINIATURE POODLES, BASENJIS, RAT TERRIERS and many other breeds. 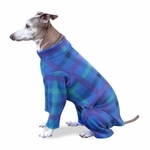 This ITALIAN GREYHOUND CLOTHING LINE comes in 3 sizes based on your IGs length, girth, weight and height. Length- From the base of the neck ( 1" in front of the withers) to the base of the tail. Girth- Measure the around the deepest part of the chest. IF YOU ARE UNSURE WHICH SIZE TO CHOOSE, GO BY THE GIRTH MEASUREMENT AND HEIGHT. 14: Length=13-14" Girth=15.5-16.5" Weight= 7-10lb Height=14"
16: Length=15-16" Girth=17.5-19.5" Weight=11=15lb Height=16"
18: Length=17-18" Girth =19.5-22" Weight=16-19lb Height= 18"
PLEASE PUT YOUR DOGS MEASUREMENTS IN THE COMMENTS SECTION OF YOUR ORDER!